There are a lot of kitchen gadgets out there. If you want to make, prep or serve anything, you can probably find a tool to help you do just that. And while I’m in the Alton Brown camp of not buying a lot of unitasking tools and keeping the gadgets down to a reasonable number, there are some kitchen gadgets that I love that really make cooking and meal prepping easier. 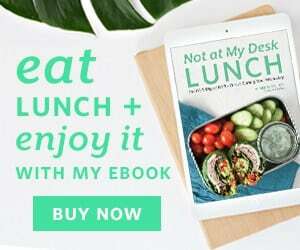 When times are busy, I’m prepping up a storm, or just a lot is going on, one of the major tools I lean on is my Instant Pot. It took me a while to get on the Instant Pot train. Like a long while. I had a slow cooker forever, and even have a traditional stove top pressure cooker. Something in me back in the day just couldn’t get on board with the IP, it didn’t feel “professional” enough. Welllll I’m not a professional chef, so I got over that. 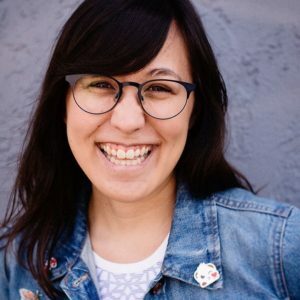 The more I learned about the Instant Pot a few years ago, the more a few things really pushed me to buy one. -It has a lot of functions (most have at least 6) that I used, like slow cooking, pressure cooking and making rice. A lot of Instant Pots (aka multicookers, if you don’t buy the Instant Pot brand), have a lot of additional functions that I don’t use yet, and a lot of them, to me, are programmed settings. -There are a lot of different models of Instant Pots, and depending on what functions you’re looking for, you can easily get a model under $100. Most of the time I use the Sauté and Pressure Cook settings, which are on most, if not all of them. Most blogs or books with Instant Pot recipes give you the manual pressure cook setting, so you won’t be in a bind if you buy one with less features. This is the model I have. -Buying an Instant Pot freed up a lot of shelf space. Especially in our last apartment, space was very limited in our kitchen. So much so that most of our appliances, pots and pans were on a wire shelf that we bought (and also prepped on). When we bought the Instant Pot, I was able to donate the slow cooker (which was a regular sized one) and my little rice cooker. If you’re in a smaller space or don’t like a lot of stuff, this could totally appeal to you too. -The Instant Pot pot is made from stainless steel. The more I was learning about cookware materials, metals and how our body can or can’t handle certain metals in certain amounts when I was studying to be a nutritionist, the more I started to look at what materials we had. I knew non-stick was troublesome before I started the program, but what I didn’t know was how much aluminum could affect your health. There have been studies that have shown possible links to increased aluminum exposure and an increased risk of Alzheimer’s, and while those studies aren’t conclusive, it does bring up a good point to be aware of how much metal exposure we have. One of the ways you can adjust the metals in your body is looking at your cookware, and a lot of it can be aluminum, from foil, to baking sheets and pans, to rice cooker pots. Stainless steel is considered a safer metal, which was another big plus for the Instant Pot. -For most functions, an Instant Pot is pretty “set it and forget it”. This is a big plus if you’re working on other meals or doing other things. 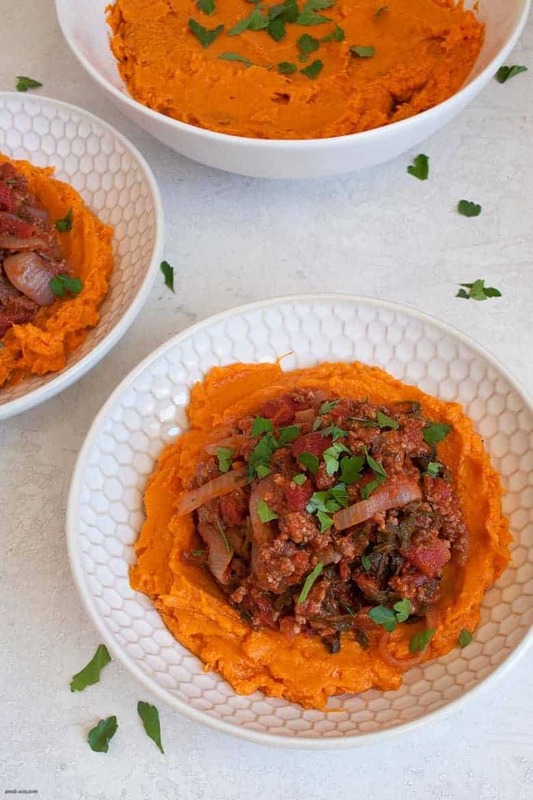 If your meal has a few components (much like this Ground Beef, Arugula and Sweet Potato Mash Bowl) you can also make one part in the Instant Pot and cook the rest while that’s going on. 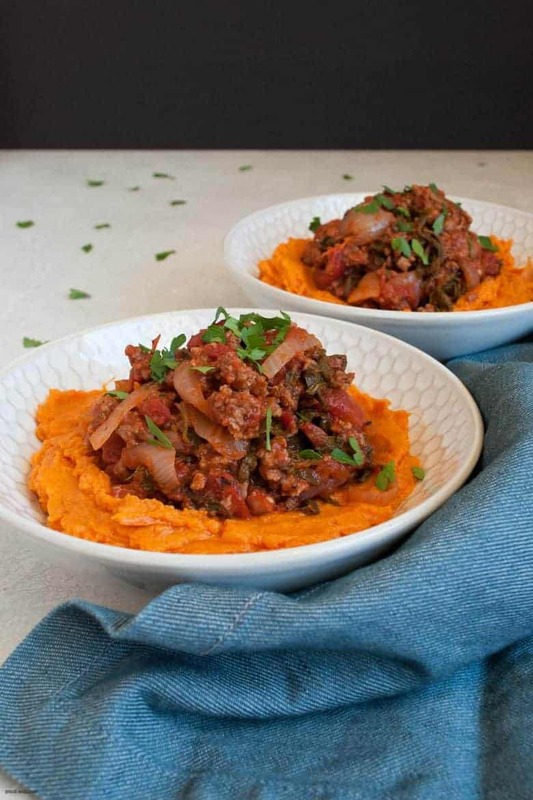 Which is the perfect segue into this Ground Beef, Arugula and Sweet Potato Mash Bowl. I cooked the sweet potatoes in the Instant Pot while making the ground beef mixture, which made this meal a lot faster to make. 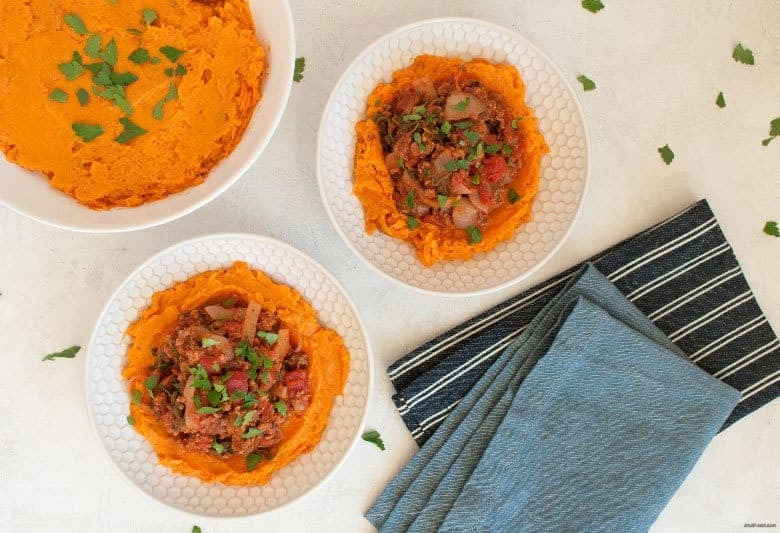 If you don’t have an Instant Pot, you can still easily make the sweet potato mash with the help of a microwave, or you can go the tradish route of boiling them on the stove. Making them with an Instant Pot is my preferred way. 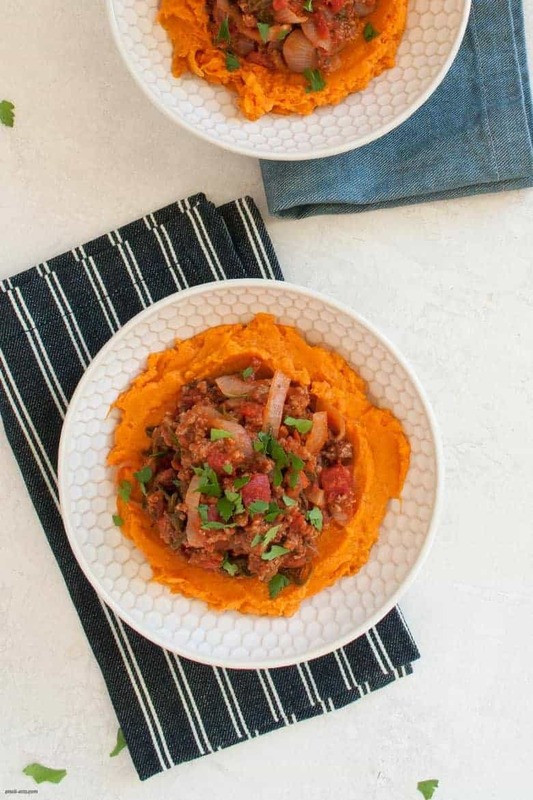 The ground beef mixture is a hearty blend of tomatoes, ground beef, onions and arugula, which is perfect if you want something warm and comforting. It also comes together very quickly and with little prep, which is also pretty awesome. You can make this dish your own by choosing different greens, like spinach (you’ll add more since it wilts faster), baby kale, or another sauté friendly green that you could get from your mixed green section (if you’re in a hurry and don’t have time to prep a bunch of greens). If sweet potato mash isn’t your jam, swap it out for regular potatoes, butternut squash, or cauliflower mash. Fill your instant pot with 1 cup of water. Place a steamer basket or the trivet inside. Cut the sweet potatoes in half vertically and place them cut side down inside the instant pot. Stack them like logs. Carefully prick all of the sweet potatoes with a fork or sharp knife. Wrap sweet potatoes in a tea towel or paper towels and microwave for 8-10 minutes. When done, prick with a fork to test doneness. Depending on the thickness of the sweet potatoes, you may have to add 2-5 minutes (to start) until the sweet potatoes are fork tender. Scoop out the cooked sweet potato flesh into a mixing bowl. With a fork, mash the potatoes until smooth. Add in garlic powder, salt and ghee/butter to taste. Bring a medium sauté pan to medium high heat and add ground beef into the pan. With a wooden spoon, break up the ground beef and cook until browned. Push ground beef to the edges of the pan and add in the onions. Cook until transcluent, about 5-7 minutes. Turn off the heat and drain half to all of the excess liquid and fat from the ground beef and onion mixture into a container or bowl (not down the drain). Turn heat back on to medium high, add in crushed tomatoes and arugula. Stir to combine and cook until arugula is wilted and tomatoes are cooked through, 5-10 minutes. Add seasonings and taste, adding more seasonings to your preference. 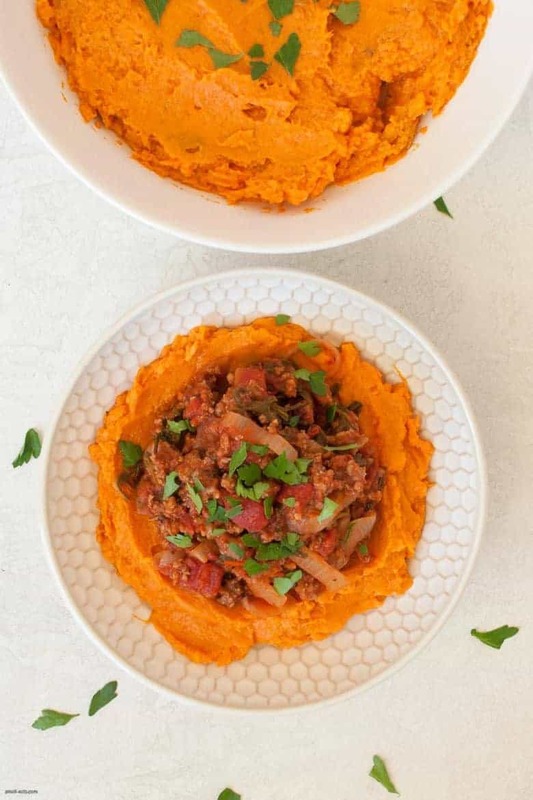 Spoon a layer of sweet potato mash in the bottom of your bowls, then top with the ground beef mixture. Garnish with fresh herbs (if desired) and enjoy.